The amount of additive that a lubricant can keep in solution is referred to as the aniline point – the lower the value the higher the solubility. The aniline point of Thermoil battery oil is low to facilitate good solubility of the specialized additives that are integral for long fluid life. ThermOil® battery oil is made with a combination of severely hydro treated naphthenic base oils and a hydrogenated polyalphaolefin synthetic oil coupled with an effective ash-less non acidic rust inhibitor. Incorporated in this is an amine type anti-oxidant and a olefin co-polymer type viscosity modifier. 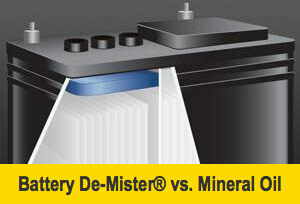 The unique base oil mix serves to eliminate polar sites, thus the oil has no inclination to attach itself to the plates of the battery – this aids in preventing the battery from premature failure during deep discharge cycles. 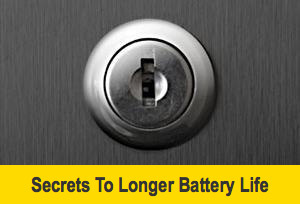 Mineral oil, as one can purchase off the shelf in any drugstore, is not an alternative to Thermoil battery oil – in order for a lead acid battery to function properly the battery must be able to breathe. When temperatures are quite cold mineral oils will become solid (place some in your freezer overnight and try to pour it from its container) this solid layer will inhibit proper venting. 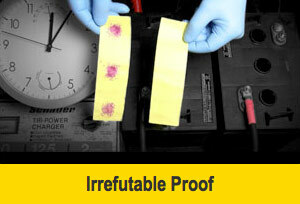 In contrast ThermOil battery oil is formulated to be fluid at temperatures as low as -50 ° F – in addition to the excellent low temperature fluidity of ThermOil our unique formulation resists thinning at higher temperatures as measured by viscosity index (a higher number represents a greater resistance to thinning) ThermOil battery oil viscosity index = 115 ; mineral oils 100 or less. As the temperature increases a thinner fluid (lower viscosity index) will exhibit more misting that can cause loss of electrolyte and corrosion –both leading causes of battery failure. ThermOil battery oil is oxidatively inhibited to prevent sludge formation (off the shelf mineral oils are not additized against the oxidative stresses that occur during deep recharging and can undergo chemical degradation that can lead to sludge formation) A viscous layer of sludge will prevent proper transfer of electrons from the lead plates thus reducing the efficiency of the battery and shortening the life of the battery. In the rigorous steam turbine oxidation test (ASTM D-943) where the sample is heated to 205 ° F in the presence of water and pure oxygen immersed in a catalyst to promote oxidation; Thermoil battery oil proved to have excellent oxidation resistance showing a total acid number of less than .20 after 2000 hours. A total acid number of 2.0 or greater is considered the condemning limit for this test procedure – uninhibited mineral oils will seldom pass 1000 hours without exhibiting a high acid number, a precursor to battery killing sludge formation.